Create doors that lead to Subspace. Magical Potions, also called Magic Potions or simply Potions, are items that Mario and his friends discover in the land of Subcon during the events of Super Mario Bros. 2. They replaced the Magic Lamps from Yume Kōjō: Doki Doki Panic. In Super Mario Bros. 2, when picked up and thrown to the ground, a Magical Potion allows Mario and friends to enter Subspace, where they can find coins (under untouched grass tufts) and Mushrooms. Also, within Subspace, certain jars will act like a Warp Zone, allowing Mario to warp to a later World. In Super Mario Advance, after finishing the game, one can find Yoshi Eggs during the Yoshi Challenge. 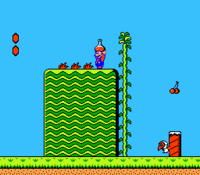 In the sequel, BS Super Mario USA, the Magical Potions are necessary to find Wart in one of Subspace's jars as he is always hidden in these dimensions. In The Super Mario Bros. Super Show!, King Koopa sometimes pulls out a Magical Potion at the end of an episode, usually when he is outmatched by Mario's group, in episodes such as "Bad Rap" and "Mario Meets Koop-zilla" and throws it, creating a Warp Zone for him to escape. The episode "Princess, I Shrunk the Mario Brothers" introduces two types of potions called the Magic Shrink Potion and Magic Growing Potion. The Magical Potion has made a brief appearance in Super Mario-Kun in volume 8. Here, Luigi attempts to give it to Mario to aid him in defeating Tryclyde. Toad has also used the Magical Potion in a fight with Wart. He enters the door the potion creates and then gives powerups to aid Mario, Luigi, and Yoshi during the fight, including Super Leaves, P-Wings, and Frog Suits. ↑ 2.0 2.1 Nintendo Power Volume 1, page 10. ↑ 3.0 3.1 Super Mario All-Stars Nintendo Player's Guide. Page 88. This page was last edited on January 17, 2019, at 03:48.